In 2018, the broader smartphone market was in a very slight -2% decline, but the premium smartphone market grew by 18%. 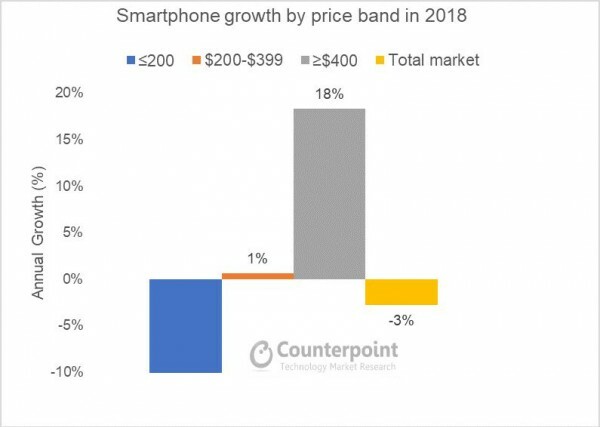 Data from Counterpoint Research from December 2018 reveals that smartphones above $400 saw most gains. Apple had 51% of the premium smartphone market, which was followed by Samsung’s 22% and surprisingly Huawei’s 10%, likely due to the excellent P20 series and Mate 20 series. The ultra-premium segment ($800+) was the fastest-growing with Apple capturing 80% of that marked. The $400-$600 price-band, however was the largest in volume. Apple unsurprisingly sold the most phones in this segment, but OnePlus saw the biggest increase of sales, spearheaded by strong sales in India! Counterpoint’s data points to recurring theme that consumers were willing to spend more on their phones last December, but are also expecting to keep them for longer. The Research firm expects the growth of the premium smartphone segment to continue thanks to the imminent arrival of 5G and foldable phones as well as the rise of the so-called affordable-premium segment. Previous articleAMD Radeon Vega VII Benchmarks Leak: Is it an RTX 2080 Killer After All?